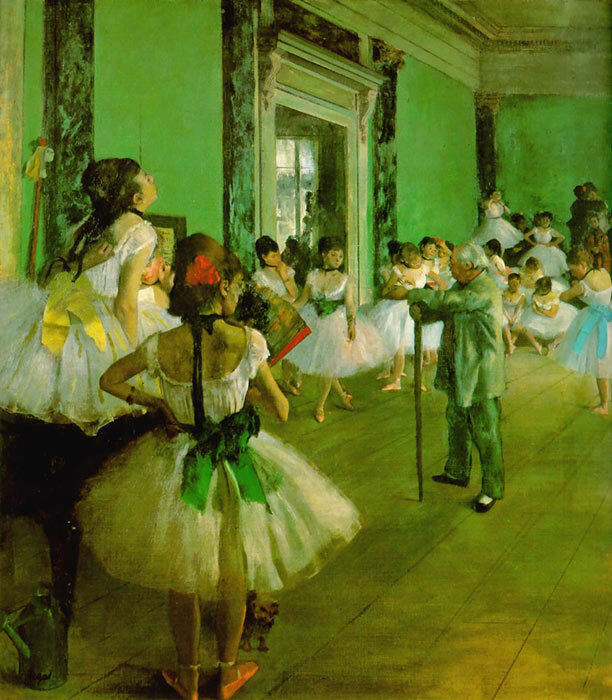 The Dance Class was exhibited in 1876 at the second Impressionist exhibition. The subject of the painting is a dance class conducted by the famous ballet master Jules Perrot. The painting is generally thought to be a tribute to the teacher rather than a depiction of an actual class conducted by him. The scene is a careful arrangement of what seems to be a random collection of postures and poses. One ballerina, who is the central focus of the composition, dances while the others mill about around her, presumably waiting their turn. Some adjust their costumes, while others just sit or stand in various postures. The women in the background on the right are the dancers' mothers, who chaperoned their young charges during the rehearsals and were there to either protect the girls from or introduce them to the wealthy male subscribers who visited the dance halls and often watched the rehearsals. SPECIAL NOTE : The painter will make the reproduction as close to the original oil painting as possible. If you want your painting to alter from this likeness, please email us and " Dance Class, 1874 " will be reproduced according to your special requirements.